For a second straight day, President Trump has found a way to talk about the "Roseanne" controversy without condemning Roseanne Barr's racist remark. He is targeting ABC and its parent company Disney, whose chief executive is Bob Iger. He is expressing resentment that ABC took swift action when Barr attacked former Obama aide Valerie Jarrett, but didn't take equivalent action when other ABC stars assailed Trump. Every case is different, of course. But Trump is tapping into a potent strain of grievance politics. It's the same thing that drives countless segments on his favorite Fox News talk shows: the notion of a double standard that hurts conservatives. So far Disney and Iger have ignored Trump's jabs. Iger's spokesperson did not respond to requests for comment. Trump's first comment on Barr came on Wednesday when he noted that Iger called Jarrett about the Barr controversy, but "never called" him "to apologize for the HORRIBLE statements made and said about me on ABC." Trump stayed on this theme on Thursday morning. "Iger, where is my call of apology? You and ABC have offended millions of people, and they demand a response," Trump tweeted. Then he added: "How is Brian Ross doing? He tanked the market with an ABC lie, yet no apology. Double Standard!" Let's unpack this. As many commentators observed, Trump turned the debate about Barr and racism into a discussion about how he is treated by the news and entertainment media. Thursday's tweet broadened out to include "millions of people," presumably meaning his supporters who feel offended by anti-Trump rhetoric on television. The White House previously criticized Jemele Hill, a columnist for Disney's ESPN, when Hill called Trump a "white supremacist" last year. Press secretary Sarah Sanders even suggested that Hill should be fired. Hill remains at ESPN. Sanders brought up Hill, Joy Behar, Kathy Griffin and Keith Olbermann by name from the White House podium on Wednesday. People say "the most horrible things about this president -- and nobody addresses it," Sanders said. She asked why Iger didn't apologize for criticism of Trump, conservatives and Christians on ABC-owned properties. Trump kept this going in Thursday's tweet. Accusations of media bias are a fallback position for the Trump administration, which demeans the press in unprecedented ways. Trump also brought up Brian Ross, the ABC News correspondent who made a serious reporting error on the day that former National Security Advisor Michael Flynn pled guilty to lying to the FBI. Ross was suspended and later reassigned. Trump tweeted: "He tanked the market with an ABC lie, yet no apology. Double Standard!" ABC may not have apologized directly to Trump, but the network did issue a full apology for the faulty reporting. "We deeply regret and apologize for the serious error we made," ABC News said the next day. As for the claim that Ross "tanked the market," the ABC report was cited as a reason for a sudden drop in the Dow that day, but stocks largely recovered by the time the market closed. Trump has repeatedly blamed Ross for the market decline in spite of the quick recovery. Trump's reaction to the Barr episode has renewed conversation about his embrace of victimhood politics. Conservative commentator S.E. 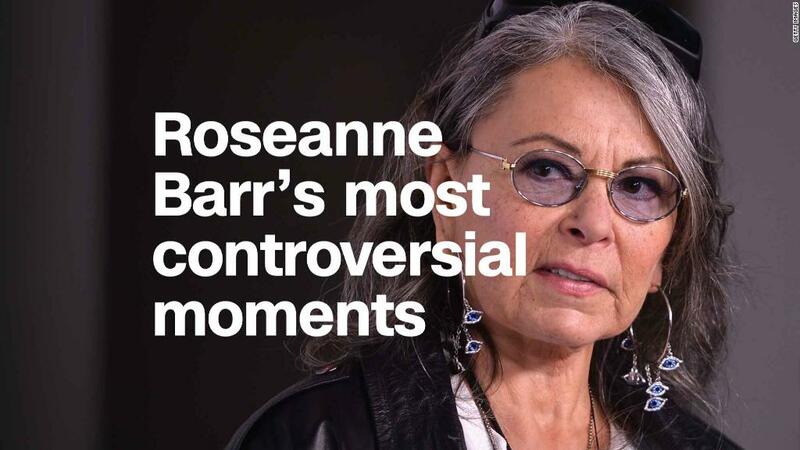 Cupp said on HLN Wednesday night, "Valerie Jarrett is taking the high road with Roseanne. As for the president? He's taking the only road he knows: Victim in Chief." Liberal columnist Kirsten Powers brought it up on CNN's "AC360," as well. "That's what he does and that's what a lot of his voters like -- to be in a state of perpetual grievance," she said.